The Centennial celebration of Naval Aviation has brought about some really colorful modern aircraft, emulating their predecessors from the yellow wing days, and, in particular, the distinctive unit markings of World War Two aircraft. They have made for some truly one-of-a-kind aircraft, and Bob Sanchez has managed to capture them for us enthusiasts. This particular sheet takes us back to the early days of aircraft experimentation and weaponry tests. 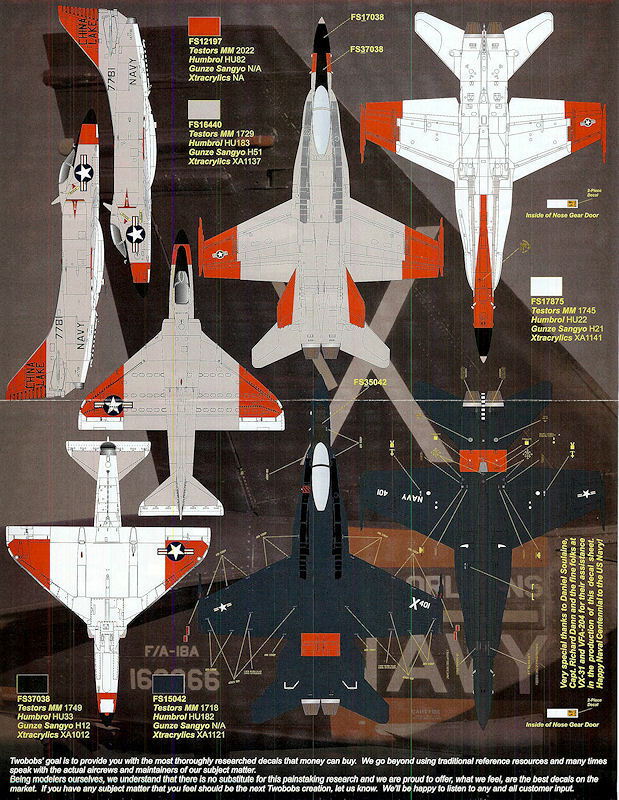 When you first look at the colorful instruction sheet, you see a red, grey and white F/A-18C of VX-31 at China Lake. This aircraft hauls around a lot of weapons and weapon sensors under its wings, doing a lot of experiments. The second is an F/A-18A of VFA-204 out of NAS JRB New Orleans as it was painted during an air show tour at Ft. Worth in February, 2011. This one is Navy blue with orange ID bands. What a neat-looking airplane. When you unfold the sheet and look to see what's inside, there's the teaser. It's a red, grey and white A-4C of VX-31. There are four views of the aircraft, but no other pictures on the side, as is typical of TwoBobs normal instruction sheets. This one's a mystery. It's not on their web site, and it's not on that neat CD that I review separately. You really have to dig to find any pictures of it, but it too was a weapons platform. Three killer aircraft all on one sheet! How often does that happen? There is one main sheet, printed by Microscale Industries in the USA (Yeah, Bob! ), along with a sheet containing F/A-18 walkways, and a tiny sheet with two 1/48th scale Naval Aviation Centennial badges. These are used on the China Lake F/A-18C. 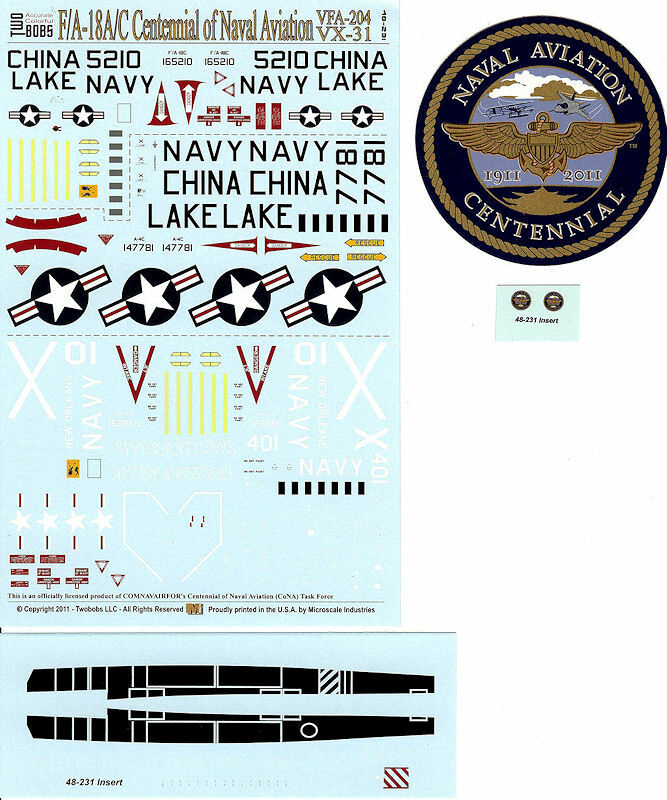 And the bonus is a full sized Centennial decal to use on your display base. All of the sheets are done to the usual high standards of TwoBobs and are in perfect register, with very minimal film around the edges. The colors are crisp and the whites are white.